The bizarre attack occurred in the Russian city of Novosibirsk, back in February. Ekaterina Tirskaya, a fan of supernatural-themed video games and TV shows, met her unnamed victim on social media, and, after hitting it off online, the two decided to meet up in person as well. They went for a date and when it came time to call it a night, the man reportedly asked Ekaterina if she wanted to come to his place for a nightcap. She accepted, and as it often happens in such cases, the two ended up spending the night together. But things got weird the following morning, as the man later told police that the woman he woke up next to was very different than the one he had bedded. And by different, he meant violent vampire out for blood. Ekaterina’s victim claims that the 22-year-old woman woke up the next day and out of the blue told him that she was a vampire. He, on the other hand, was an atheist, so he told her that he didn’t believe in the supernatural, and that she should leave. But as he tried to go to the bathroom, the self-confessed vampire grabbed a knife and tried to stab him. The shocked man reportedly managed to grab her arm and wrestle the knife out of her hand, but she quickly grabbed another one and managed to stab him in the chest with it. With no wooden spikes or holy water on hand, the man had no choice but to run out the door of his apartment and start knocking on his neighbors’ doors while shouting for help. Luckily for the victim, some of his neighbors came to his aid, subduing the “vampire” while others called the police. 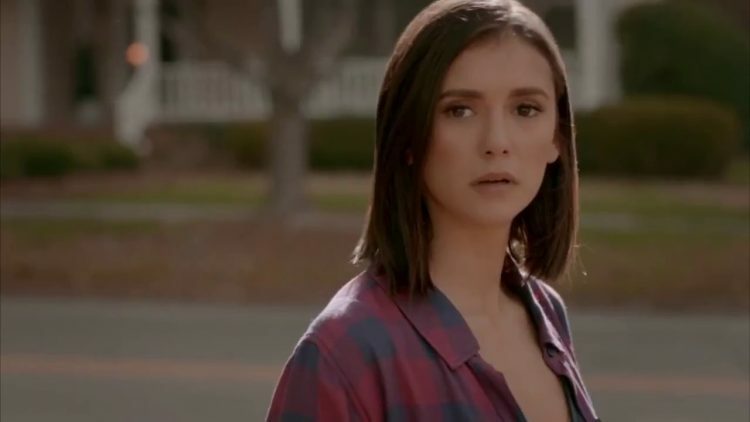 A police report later showed that when questioned by officers about the unprovoked attack, Tirskaya simply told them that she was Elena Gilbert, the main female protagonist of the hit TV series The Vampire Diaries and that she had tried to kill the enemy, which in this case was a werewolf. The bizarre attack took place almost a year ago, but following a psychiatric evaluation which concluded that Ekaterina Tirskaya was of sound mind, the supernatural fan was only recently convicted to two and a half years in prison. Judges also ruled that she should pay her victim 330,000 rubles ($5,000) in physical and emotional damages. Ekaterina’s victim survived the stab wound, but has yet to recover mentally. The Komsomolskaya Pravda newspaper reports that he lost his job, is currently seeing a therapist and often has nightmares about the blonde “vampire” he met on the internet.